Public works departments and other local government agencies increasingly rely on a mosaic of information management systems to improve operations, meet demand and plan more effectively. Three technologies in particular work well together to keep information and public works processes moving: vehicle telematics, geographic information systems (GIS) and work management software. Vehicle telematics solutions combine a smart network gateway attached to a truck or other asset, sending back information about the vehicle’s location, engine health and other factors over a cellular connection to a cloud-based application or platform. GIS technology, often integrated into a telematics solution, provides a framework for gathering and managing geographically based data such as snowplow routes, topographic features or the locations of city dumpsters. Public works management software manages work orders, schedules and other existing data systems. When working together and sharing information, these three systems help streamline processes and improve asset visibility. GIS-based Automatic Vehicle Location (AVL) systems provide integrated tools to help cut costs and improve productivity. 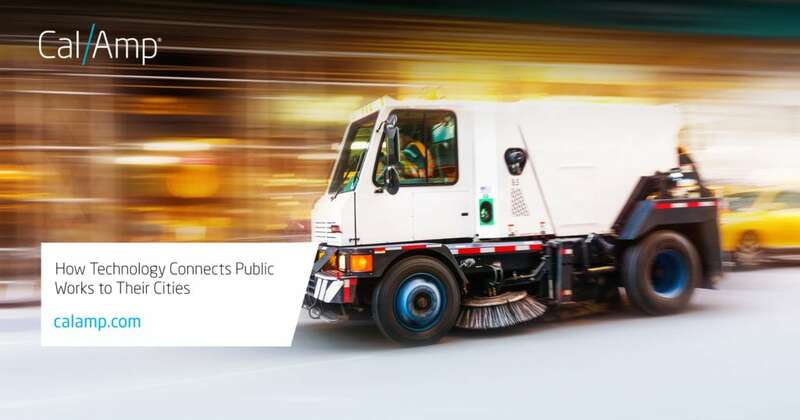 AVL solutions can be designed specifically to address the unique needs of the public sector and has been optimized to manage solid waste collection fleets, increase workforce productivity and help fleet managers adhere to solid waste collection schedules. Routing software, which often has integrated GIS, helps increase the visibility of the fleet, efficiency of road maintenance such as snow removal and street sweeping, and better scheduling for trash pickup, litter control, pavement repair and other operations. When GIS technology is integrated with work order management, public works managers can use geographic data to optimize job routing and notify customers and businesses about upcoming work. With asset management software, it is easier to manage your mixed fleet in groups and filtered by type, age, location and other aspects. This data administration simplifies both scheduled maintenance and unexpected repairs. When integrated with a work management system and GIS software, scheduled work is searchable and viewable on a map to aid in planning routes and responding to emergencies by locating the nearest fleet vehicle. Vehicle telematics solutions enable a fleet manager to see the current location of every vehicle in the fleet, examine a detailed trail showing the path of any specific vehicle and even replay vehicle activity history. This helps operations understand driver activity and traffic patterns to ensure that service routes are covered efficiently. When unexpected events occur, due to factors such as traffic or weather conditions, the ability to respond promptly is important. Tracking route progress and driver activity improves safety and response times, detects problems quickly and ensures that actionable decisions can be made. Vehicle location data can be overlaid on GIS maps that provide detailed information such as infrastructure, assets, routes and facilities, so that managers can direct resources to incoming calls as well as study trends in the context of relevant information. With telematics-based reporting, fleet managers can improve operations by reviewing historic work order patterns, driver behavior, vehicle performance and localized demand. The results of such trend analysis feed into improving dispatch and driver productivity, lowering fuel consumption and maintaining vehicles longer. Demand assessment helps identify which routes or route segments are over- or under-served in order to improve both the customer experience and the driver’s job at the same time. The City of Ann Arbor, Michigan, selected CalAmp’s government fleet solution to provide real-time visibility of its fleets for operations and residents integrated with Esri ArcGIS. The city also built a web portal that allowed customers to view plow locations and status so that residents could see the progress of street clearing during and after snowstorms. City dispatchers track vehicle locations in relationship to work orders, routes, zones and infrastructure on the GIS-based map improving response times. The system also lets drivers report reasons why a service could not be completed, such as a blocked street or solid waste bin. This information is immediately available to staff who respond to calls from citizens. Access the full case study here. Public works departments are using fully integrated IoT telematics data to increase the capabilities and effectiveness of their services while lowering costs. It also connects them to their cities and citizens by providing real-time updates, online request for work submissions and more. To find out how CalAmp can help you improve operations, visit our government fleets solution page here. Meet with CalAmp in person at the 2018 APWA-PWX expo on August 26 – 28 in Kansas City, Missouri. Stop by booth #2406.